Jackpots in a Flash is one of Microgaming’s more experienced online casinos. It has been in the online gaming market for just over a decade; so, while the design may look a little outdated, the operator knows just what players want. With hundreds of online casino games, players will be spoilt for choice, and there are plenty of chances to earn loyalty points and cash back bonuses at this popular online gambling website. When it comes to bonuses, Jackpots in a Flash is somewhat lacking. The first deposit bonus is a 50% match bonus up to $100. While this is a very generous deal for casual gamers, high rollers may find that something is missing. We highly recommend this site for players on a budget, as $100 will go a very long way when you’re a casual player. When it comes to ongoing promotions, they change every month, so players are always in for something new. However, these promotions tend to focus on comp points. For example, Mondays offer double the comp the points on slots while weekends provide players with triple the comp points on table games. If you play often enough, you’ll find that the comp point bonuses add up very quickly and you can earn some generous cash-back prizes. Being a Microgaming-powered online casino, Jackpots in a Flash offers players some of the best online casino games in the market. There are 190 titles available at this online gambling website. While this is less than larger Microgaming websites like Spin Palace and Ruby Fortune, the operator has made sure that all of the most popular online slots are available at Jackpots in a Flash. These include games like Tomb Raider, Cabin Fever, Dolphin Tale and Cabin Fever. The majority of the slots games at Jackpots in a Flash (of which there are 70) are 1-payline slots. While these a very basic slots games, they offer up a classic online gambling experience, where making winning combinations can be much easier than it is when playing multi-line slots. Living up to its name, Jackpots in Flash also offers players a great selection of progressive jackpot titles. Being part of the Microgaming progressive jackpot network, the games offer some of the most generous prizes that you’ll find in the online gambling world. Of about 20 Microgaming progressive jackpot games, Jackpots in a Flash has 12 of them, including Major Millions, King Cashalot and Fruit Fiesta. The casino also offers some non-slots progressive games, such as video poker and let it ride. 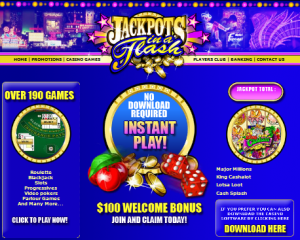 All 190 of Jackpots in a Flash’s games are available in the downloadable version of the casino. There is also a Flash-based version for Mac users, which includes the game’s most popular titles. 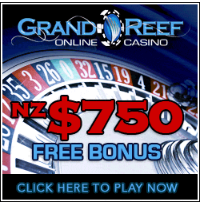 So, a wide range of players can enjoy their time at this online casino. Being powered by Microgaming, Jackpots in a Flash is protected by an additional layer of certification. As such, this online casino is certified by eCOGRA in addition to having been authorized by the Lotteries and Gaming Authority of Malta. This means that players are guaranteed a safe and secure online gaming experience. Should players ever need to contact customer support, agents are available via email, live chat and telephone. Players will also find a FAQ that aims to answer all questions about the casino and its software, so they can troubleshoot their own issues if need be. When it comes to banking for New Zealand players, there are plenty of options available, including credit cards, debit cards and e-wallets. However, we highly recommend using PayPal. It has been quite some time since this particular method has been offered in the online gambling market, but we are pleased to see that it has returned. It is one of the most trustworthy sources of online banking, and players should take advantage of this option. Jackpots in a Flash offers players a great online gambling experience for players who are looking for a wide range of Microgaming titles. In addition to offering up 190 online casino games, the casino also aims to impress players by providing generous comp point bonuses and trustworthy banking options such as PayPal.